mmm...so cute and so gluttonous. my favorite combo. Pals in Kingsport, I will be back. My fella was born in raised in the lovely tri-cities area, more specifically Kingsport, K TOWN DOWN! Don't misunderstand anything in this entry as me putting any blanket assumptions over on his hometown and its surrounding area, because I am not. I am merely making observations of some of the more random things I saw that fell under the umbrella of "only in Bristol." An easy example would be the sign't we passed en route to the TN/VA line for Rhythm and Roots. Tell me if this doesnt come off as the misplaced understatement of the century. 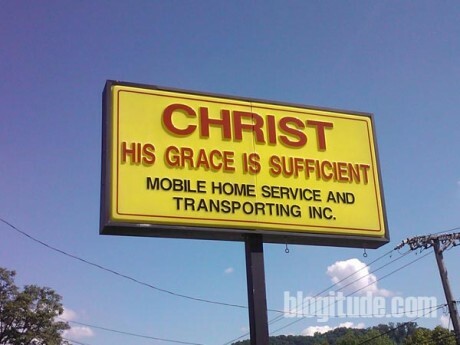 I have seen ol' JC pimped out a lot, but now he is selling mobile homes? I am fairly sure that was covered in Corinthians, but then again, I was raised Catholic, so I really have no idea what I am talking about. Between attending amazing shows that blew our socks off and eating various confections deep fried in funnel cake batter and served out of gas guzzlers, we poked into a bevvy of antique stores. [Tangent: Color me happy that my fella enjoys antiques and ladies! That combo is rare.] I love looking through, old treasures- but I questioned some of the "treasures." Like, if you were in the market for racist cookie jars, you would be in luck in this one store. [Tangent: They didn't have a blackface section, but they may as well have. Jamie and I even started to play a game of "spot the racism."] They also just had things very oddly merchandised. how terrible is this? I am kind of glad it is for sale still...because that means no one is buying this to display in their home...which is how it should stay. this is gonna be my nativity scene this christmas. Also, where else other than Bristol Rhythm and Roots do you see a man in a pig costume playing Foo Fighters song outside a BBQ tent. NOWHERE! This porker wasn't the only sidewalk attraction. On every street was someone with a fiddle or juggling balls [Tangent: There was one guy dressed kinda odd wearing a top hat that we passed walking through the crowds Friday, and Jamie said to me, "That guy looks like he knows how to juggle." I suspected he also owned some devil sticks. The next day we saw him on the street corner juggling and showing off his devil stick skills. WE SO SMART!!] Then there were really talented musicians and not so talented but adorable kids who could play one chord on a guitar that were making bank! [Tangent: In street busker world, adorability is more lucrative that talent. Lesson learned.] By next year I need to learn to play the rainstick or woodblock or something. Yes, that might take a year; I lack musical talent. i'm loving the ghost and the mary's together! who new baby jesus was a skull and a pumpkin. I cannot handle the pictures... I am glad you took so many because I would have totally not believed you. Amazing.